Tube flies have several distinct advantages over flies tied on hooks. However, one of the troubles often associated with tube flies is that the absence of a hook makes them difficult to store in most fly boxes. The people at Eumer Pro Fishing Accessories tackled this problem, and in their quest to build a better mouse trap, they designed the Eumer Tube Fly Box. The Eumer Tube Fly Box offers a simple way to store your tube flies and keep them organized. It has 36 small tapered spikes which you slide your tube flies onto. Tube flies are secured on the spikes via small “grooves” which help keep the tube from slipping off. These grooves also enable each spike to accept an array of tube diameters. Each of the six rows turn via a small knob that sticks out from the side of the box, allowing you to easily access your tube flies. One nice thing about the rotating rows is that your flies can be left in the upright position to quickly dry out after fishing trips. There are also five rows of micro-slit foam on the inside of the lid. This is a great place to store loose hooks, or, you can use it for flies tied on hooks. 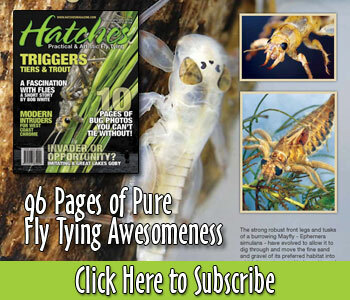 To learn more, visit the Eumer Products’ website, or inquire at your local fly shop.